"On tonight's show, we examine the issues of diversity and inequality in Wisconsin's workplaces ..."
A few months ago, a reporter from Wisconsin Public Television reached out to us for a story she was doing about why or why not young professionals - particularly marginalized folks - decide to settle in Wisconsin. 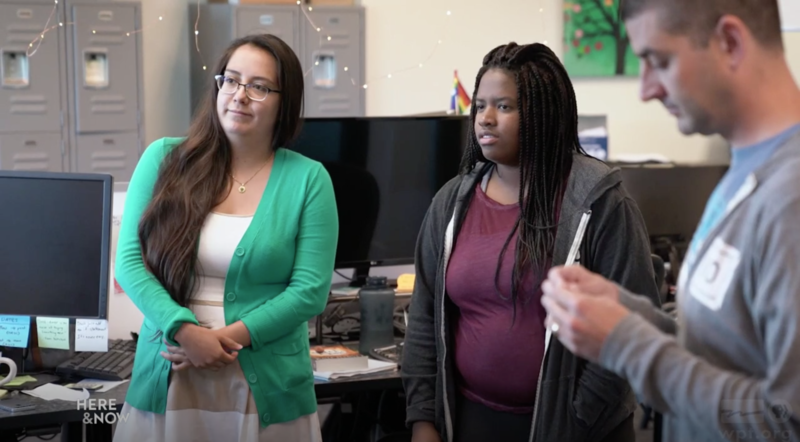 WPT was interested in Ten Forward because of our long-term relationship with the YWCA's YWeb Career Academy, and wanted to showcase Ten Forward as an example of a Wisconsin company interested in and able to attract those self-same young professionals. There are always things we can do to continue improving and progressing toward being an inclusive company, and we're glad that WPT is examining this issue. The reporter, Marisa Wojcik, spent a morning hanging out in our office and chatting with some of our staff (in particular, our junior developers, Charielle McMullan and Victoria Guerrero). The conversation we had with Marisa Wojcik was therapeutic and introspective. It was very cathartic to discuss the ways that Madison isn’t always welcome to young professionals of color and to know how fortunate I am to work for an inclusive company with such an empowering mission. Our chat with Marisa Wojcik was necessary and inspiring. I believe that members of the Madison community are working hard to ensure that individuals from all backgrounds can grow and be successful. I am thankful to work for such a great company that constantly strives to create inevitable successful for its members. The segment featuring Ten Forward starts at 13 minutes 20 seconds, but the entire video is definitely worth watching. "When you double in size, it's vital to set clear expectations. Here's how we did it at Ten Forward."